We love adding grains to a salad to bulk them up into a hearty meal. 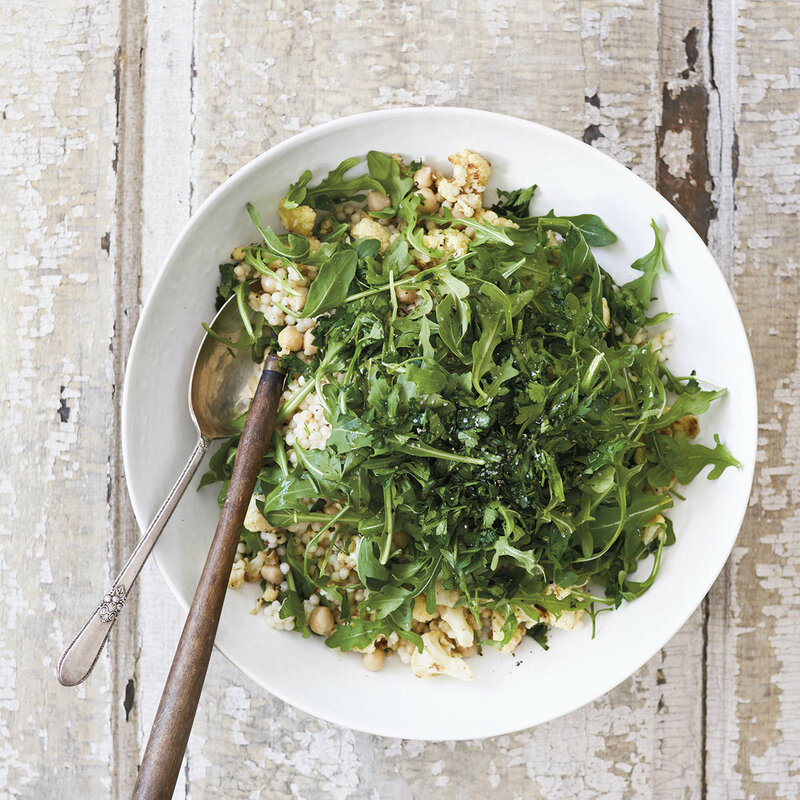 The couscous and chickpeas provide substance while the arugula keeps it light. Adjust the amount of cumin to your liking, and be sure to use plenty of lemon juice for a bright, citrus flavor. Chop cauliflower florets into small- to medium-sized pieces, taking care not to use too much stem. Place on a baking sheet along with garlic and drizzle with about 3 tablespoons olive oil. Season with cumin, salt, and pepper. Using your hands, toss cauliflower, coating well with oil. Roast for about 30 minutes, stirring once halfway, until softened. Start checking after 20 minutes; smaller pieces will cook faster so toss cauliflower around each time you check it. Remove from heat and allow to cool to room temperature. Meanwhile, make couscous. In a medium saucepan, bring water (or stock) to a boil. Add couscous, cover, and simmer for 8-10 minutes, stirring occasionally, until couscous is cooked and liquid has evaporated. Fluff with a fork. Once cauliflower has cooled, remove cloves of garlic from baking sheet and place on a cutting board. Using back of a knife, smash garlic into a paste. Place paste in bottom of a serving bowl and add lemon juice. Season with salt and pepper and whisk to combine. Add couscous, cauliflower, and chickpeas, and toss to combine. Add parsley and arugula and gently toss again. Drizzle with a bit of olive oil and additional lemon juice and serve immediately.